Lucy Hunter has just returned to Townsville from Afghanistan. She expects her fiancé to pick her up from the airport, but finds her mother has arrived instead. After a turbulent homecoming, and with time on leave, Lucy decides it’s time to find out who she really is and what it is she wants. Leaving for Cornwall to uncover more about her family’s English heritage, Lucy stirs up more than her own emotions. Her mothers past and that of her grandparents is tied deeply to Cornwall, and secrets buried for decades are brought to light. I picked up The Secret Years at my local mall recently. I’m behind on my challenges so needed to get reading if I want to make my reading targets by the end of the year. Especially since NanoWriMo will eat a month of my time in November. 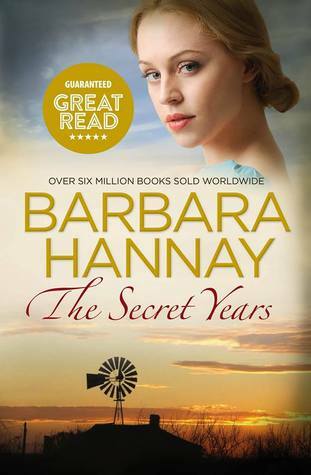 I didn’t know what to expect, other than it met the criteria for my challenges (I haven’t read any other books by Barbara Hannay before). I felt like the book was a little slow to begin with, but once it got going I was well and truly hooked. The novel is told through multiple viewpoints: Lucy, her mother Rose, and her grandmother Georgina. The contrast in time (world war two and present day) and various settings served the story well. The characterisation was brilliant. I wanted Lucy to find what she was looking for, I was curious about Rose’s past, and I felt anxious for George and Harry. The Secret Years delivers a rollercoaster of emotions. George and Harry’s story was by far the best part and I loved every second of it. Of course I cried (I’m becoming such a sensitive little petal as I get older). The mark of a great author is someone who can prompt a reader to look more carefully at their own lives. This book has really struck a chord with me and I am determined to find out more about my own family history, as Lucy did, through my grandparents and parents.